Judge Hebert assumed the office of Fort Bend Constitutional County Judge on January 1, 2003 and retired on December 31, 2018 after 16 years in office. As County Judge he presided over Commissioners Court of the 10th largest county in Texas with a population exceeding 765,000. He also served as a member of the County Juvenile Board, Purchasing Board and Elections Commission. Upon graduation from Pampa High School in Pampa, Texas, Judge Hebert joined the US Navy and served four years as an Aviation Electronics Technician Aircrewman. Judge Hebert received his undergraduate degree at what is now the University of Houston (Downtown), completed the Advanced Management Program at the UT Graduate School of Business, holds an MBA from Pepperdine University’s Graduate School of Business and Management, and received his PhD in Management from California Coast University in 2004. Judge Hebert has over forty years of experience in the private sector serving the national water industry as Chairman and Chief Executive Officer of Eco Resources, Inc. and Southern Municipal Services, Inc., and through his firm, Robert Hebert and Associates, as a senior consultant to regional, national and international business and public entities. Additional private sector experience includes twelve years on the Board of Directors of the National Council for Public-Private Partnerships in Washington, DC with four years as Chairman, and seven years as Vice-Chairman of the Greater Fort Bend Economic Council in Sugar Land, Texas. 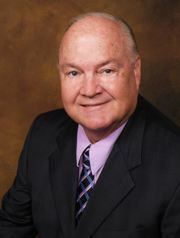 His prior public service includes three years as Trustee and President of the Alief ISD School Board, six years as a Director and Vice President of the Brazos River Authority, eighteen months as a consultant and acting city manager for the City of Rosenberg, Texas and eight years serving the State of Texas as Temporary Receiver for the City of Arcola, Texas. Judge Hebert currently serves as a member of the State’s Region H Water Planning Committee, as a member of the Texas Leadership Roundtable on Water, and he is a member of the Texas Water Conservation Association and the National Water Resource Association. He and wife Pat currently reside in Foster Creek Estates in West Fort Bend County. They have three daughters, five grandsons and two great-grandsons.